The news out of Copenhagen this week is good. Apart from an arsenal of over 20 permanent sensors dedicated to counting bicycle traffic, the City of Copenhagen also performs comprehensive bi-annual counts and the latest numbers, from September, are exceptional. For the first time since the City starting counting traffic entering the city centre, there are more bikes than cars. Indeed, since last year, 35,080 more bikes were counted, bringing the total up to 265,700, as you can see on the graph, above. It is a clear indication that continuous municipal policy and investment in Best Practice infrastructure pays off. The City has gone above and beyond over the past ten years. Investing 1 billion DKK (€134 million) extra in infrastructure, facilities and, not least, bicycle bridges to prioritise cycling as transport. The City counts traffic in two places. Crossing the municipal border (into the orange from any direction on the map at left) and then entering the city centre itself - illustrated at on the map at right. 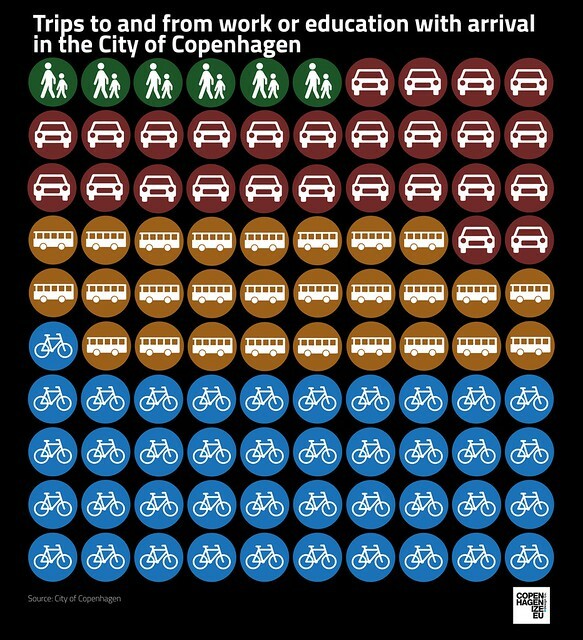 The numbers exclude the many bicycle trips across Copenhagen that don't cross one of the two lines and it doesn't include trips in Frederiksberg - that municipal "island" surrounded by Copenhagen. Nevertheless, it's how the City has counted twice a year since 1970. The importance of reliable data cannot be understated. It is paramount that every city records in detail, in order to convince sceptics, plan for the future expansion of the network and basically just know what the hell is going on. 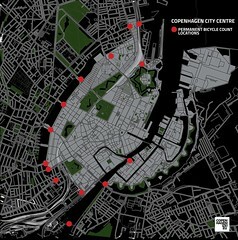 Here is a selection of bicycle counting points around the city centre. Bryggebroen and Inderhavnsbroen are bicycle bridges (with pedestrian facilities, too) so there is no car count. 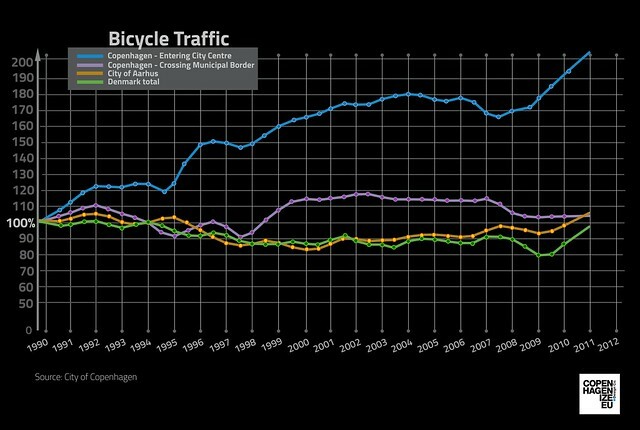 On all the rest you compare the numbers of bikes and motor vehicles. Except for the main roads leading into and through the city, bicycles are dominant at most of the locations. 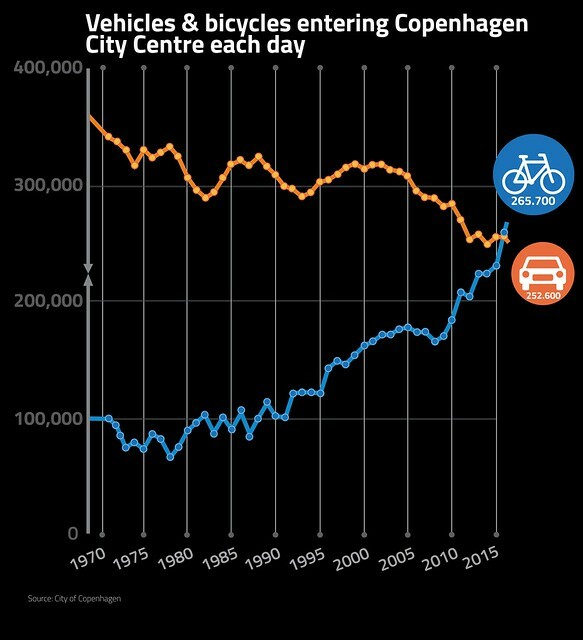 It's no secret that cycling for transport is down in Denmark on a whole. Widespread prosperity (the financial crisis didn't really register here) and the fact that buying a car is cheaper now than during the oil crises in the 1970s means that people are buying them, despite the (rather irrelevant) 180% tax on cars. They are, however, buying then outside the larger cities and often buying a second car for the family. Car ownership in Copenhagen is still low at 25%. 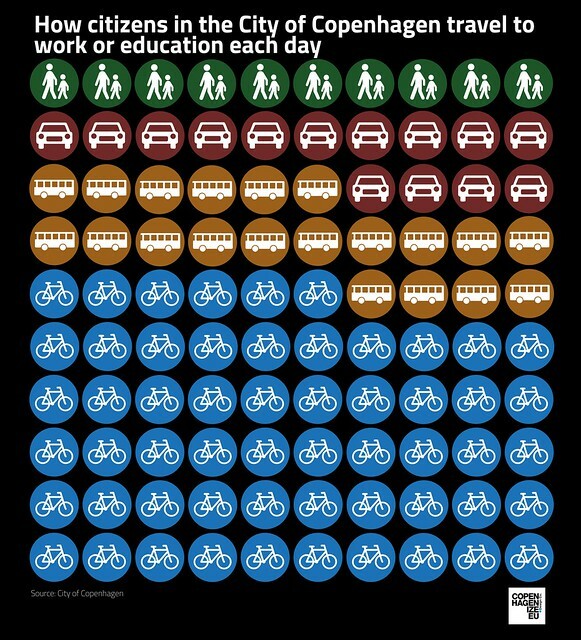 Even though a resident's parking permit can be bought for a ridiculous €100 a year, it is clear that Copenhageners prefer bikes and public transport. Especially the former, as you can see on that spectacular blue line, above, shooting through the top of the chart. Citizens with an address in the City of Copenhagen choose, in overwhelming numbers, the bicycle to get around. 56% in total. 20% choose public transport - buses, trains or metro. Only 14% choose to drive a car to work or education each day. 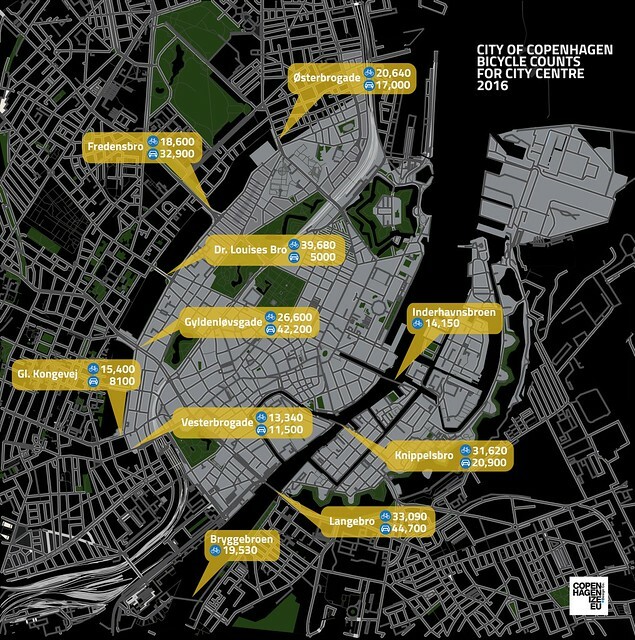 When you look at how people arrive at work or education in the City of Copenhagen - from the 22 surrounding municipalities and the City of Frederiksberg - the numbers are still impressive. 41% arrive on a bike. 27% arrive via public transport. 26% arrive in a car. There are still challenges. The City has a policy that bicycle traffic and public transport usage must never fall below 30% and car traffic must never rise ABOVE 30%. Investment is sorely needed to improve public transport and make it more competitive against car traffic. It is also very relevant to mention that the city is still rather difficult to drive around, what with the construction of 17 new metro stations. We have written about The Greatest Urban Experiment Right Now and the City still has to prepare for the future. The modal share for bikes has slipped already. We need to ensure that we maintain the rising numbers.